It’s the best of the best! Disney has a grand total of 8 Deluxe Resorts including: Animal Kingdom Lodge, Beach Club, BoardWalk Inn, Contemporary, Grand Floridian, Polynesian Village, Wilderness Lodge, and the Yacht Club. With a vast span of 17 pools, here’s all you need to know before you prepare for that cannonball splash! Note: At all Deluxe Resort Pools, hours and lifeguard availability vary by pool. Complimentary towels are provided at all pools. Shade structures and lounge chairs are available in a first come, first serve fashion. All pools are located outdoors but are heated for those cooler months in Florida. 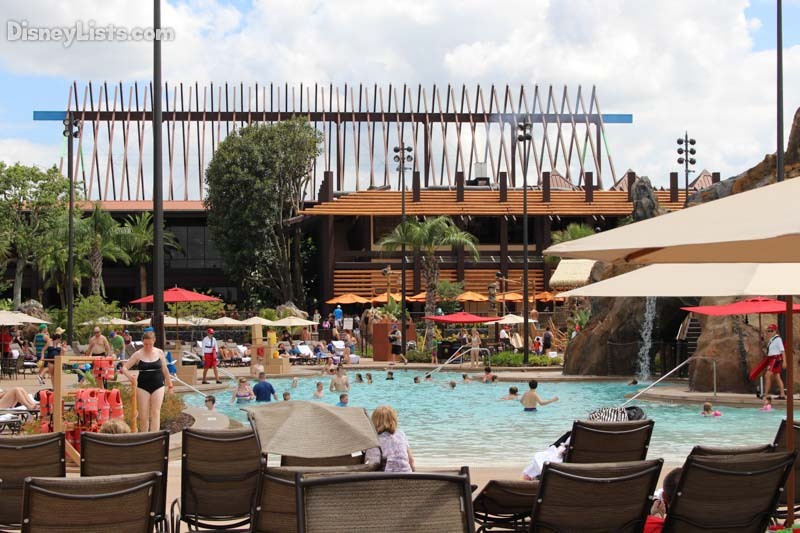 Features: “Herd” over to the Uzima Springs Pool next to the Jambo House. This pool is a 11,000 sq. ft. tropical oasis! Relax under the palms or take a dip into the zero-depth entry, as if you were entering a beach. Enter a bolder way with a ride down the 67-foot-long waterslide! Kiddie Area: Steps from the Uzima Pool is the Wading Pool which is a simple circular pool located near the Pumbaa’s Fun and Games Arcade. On the other side of Uzima, kids can enjoy the Hakuna Matata Playground. Spa: Check out either of Uzima’s two whirlpool spas with one located near the slide and the other perfectly positioned near the pool bar. Pool Restaurant/Bar: Uzima Springs Pool Bar is just steps from the Uzima pool. The “springs of life” are alive and well with multiple cocktails, wine, and beer. Hungry? This pool bar has burgers, flatbread, salads, and more! 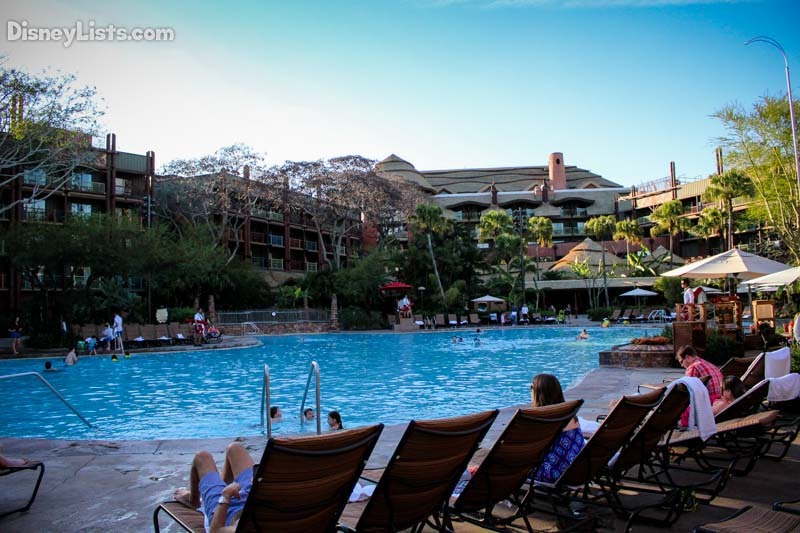 Features: Kidani Village offers a great pool called Samawati Springs. This pool is smaller than the Uzima Pool with 4,700 sq. ft. – but is our favorite of the two. Slide down the large, 128-foot waterslide or step in with a zero-depth-entry. Kiddie Area: Samawati wins out between the two pools for their Uwanja Camp which is a water playground! Uwanja boasts 3 distinct zones for kiddos to play including an Observation Station, Departure Zone, and Base Camp. Water cannons, leaky towers, bubbling geysers… Uwanja Camp has it all. Spa: Just like Uzima, Samawati offers two relaxing whirlpool spas. Pool Restaurant/Bar: Swahili for “water”, the Maji Pool Bar takes their water to a whole new level with great alcoholic and non-alcoholic beverages. Plus, just like the Uzima Pool, food such as burgers, sandwiches, and more are served here. *The fantastic pools below are shared between these two Deluxe resorts. Features: A 3-acre water wonderland, Stormalong Bay is the main feature pool that is shared by the Beach and Yacht Club Resorts. Truly a beachside water park with a shipwrecked theme – your family will love the sand-bottomed pool, the 230-foot-long waterslide, and lazy river. Kiddie Area: The kiddos will love the Shipwreck Pool at the base of the large waterslide, but will especially enjoy the miniature waterslide available for them! Spa: Unwind in one of the 3 whirlpool spas or relax on the elevated tanning deck. 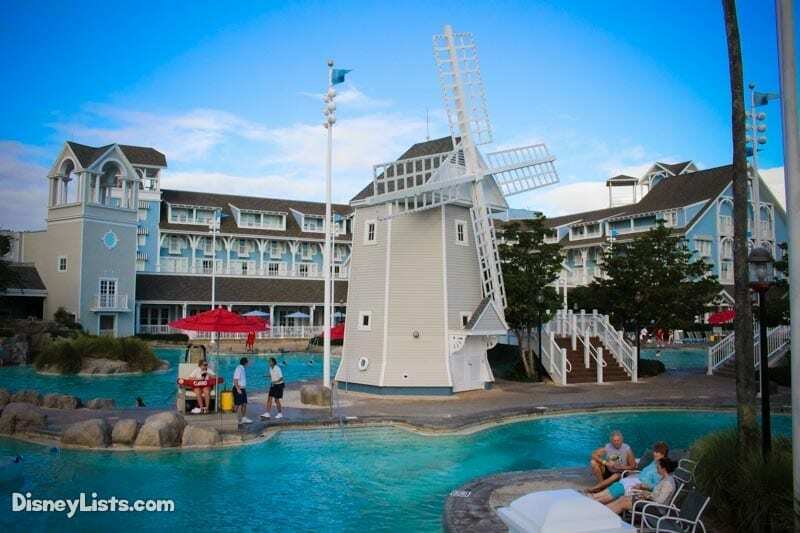 Pool Restaurant/Bar: Hurricane Hanna’s Waterside Bar and Grill provides refreshing beverages and tasty snacks and meals from Mickey’s Ice Cream Bars to a Lobster, Shrimp and Scallop Roll. Features: Looking for a quiet place to take a dip? Check out one of the three leisure pools. Keep in mind all pools include whirlpool spas. Tidal Pool @ Beach Club – a 43,000-gallon pool at the far end of the resort facing Crescent Lake. Admiral Pool @ Yacht Club – a 54,000-gallon pool in the Yacht’s garden area. Dunes Cove Pool @ Beach Club – a 55,350-gallon pool located at the Villas. 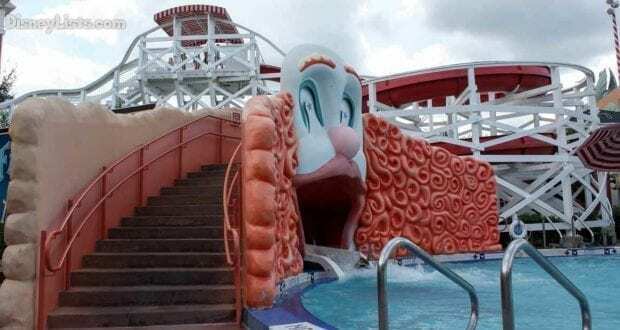 Features: Luna Park is a 1920’s carnival-themed pool that invites guests to take a fun dip in its 184,217-gallons. Home to a 200-foot-long waterslide that looks like a rollercoaster and cute spouting trunks from elephant statues, this is a great pool to clown around in! Kiddie Area: Steps from Luna Park is the Luna Park Crazy Play Area which is a great place for the kids to splash around in and has two play structures as well. Spa: Adults, BoardWalk has you covered with their serene whirlpool spa. Pool Restaurant/Bar: Leaping Horse Libations sits close to the Luna Park Pool and can’t be missed with its carousel appearance. Sandwiches, snacks, and fun adult beverages are available. Features: Tranquil swimming is available at either of the 2 leisure pools. One pool is south of the Luna Park Pool (near the Community Hall) while the other is on the east side of the resort. Both feature whirlpool spas. Features: The Contemporary has a “Main” or “Feature” Pool. With exceptional views of the marina and white-sand beaches, this Main Pool also offers a 17-foot-high curving waterslide. Kiddie Area: Kids love to splash around in the fountains and waterspouts which make for a water playground at the Main Pool. Spa: Two whirlpool spas are available for adults. Need a quieter space to relax in? Check out the Bay Lake Pool information below. Pool Restaurant/Bar: The Sand Bar has all the usual fantastic signature cocktails along with quick service style snacks and food like burgers, salads, and sandwiches. Seasonal poolside service is available during select times. Features: Close to the Main Pool, the Bay Lake Pool is the perfect place to pamper yourself by renting on of the poolside cabanas by the hours or for the day. A flat-screen TV, iPod docking station, resort phone, and mini-fridge are all available with a cabana rental. This round pool is shallow on the outside and gets deeper in the center. A quiet space for especially for those that have decided to rent a cabana but available to all guests. Kiddie Area/Spa/Restaurant/Bar: All located at the Main Pool (information above). Features: With a name like the “Lava” Pool, one can only suspect a towering volcano as the focal point of this pool. No worries – the only thing pouring out of this volcano is a 142-foot-long waterslide and beautiful waterfall. Step in slowly with the zero-depth entry or lounge back in a chair with a view of the Cinderella Castle at Magic Kingdom in the distance. Kiddie Area: Kids will fall in love with the Kiki Tikis Splash Play area which holds true to the Polynesian theme in design and boasts water jets, wading pools, water jets, waterfalls, and two slides! Spa: The whirlpool spa awaits for a chance to relax your muscles and enjoy the remarkable scenery. Pool Restaurant/Bar: Coming out of the volcano, sits the Barefoot Pool Bar. With alcoholic and non-alcoholic beverages flowing, it’s hard to pick just one specialty cocktail! No food is served at this location – although Cook’s is close by if you need a bite. Features: Not too far from the Lava Pool is the Oasis Pool which tends to be much less crowded. This is a great pool to enjoy the lush greenery and a more relaxing dip. Kiddie Area: You’ll want to head to the Lava Pool for kiddie fun! Spa: A simple whirlpool spa is available for adults to take in the oasis. Pool Restaurant/Bar: No restaurant/bar by the Oasis – head to the Lava Pool for drinks. Features: Take in the beautiful architecture of the Wilderness Lodge when visiting the Silver Creek Springs Pool among pine trees and boulders. Slide down the 67-foot waterslide that is built into the rocks. Kiddie Area: A kiddie pool is available close to the Silver Creek pool and provides fun slides and overflowing buckets. Spa: Must like one would expect at a springs themed resort, guests can relax in the hot and cold whirlpool spas at the Silver Creek Springs Pool. Pool Restaurant/Bar: Trout Pass Pool Bar looks like something straight out of the old toy Lincoln Logs! Specialty drinks, beer, wines, and cocktails are bubbling out of these springs. You won’t find any food at this location however. 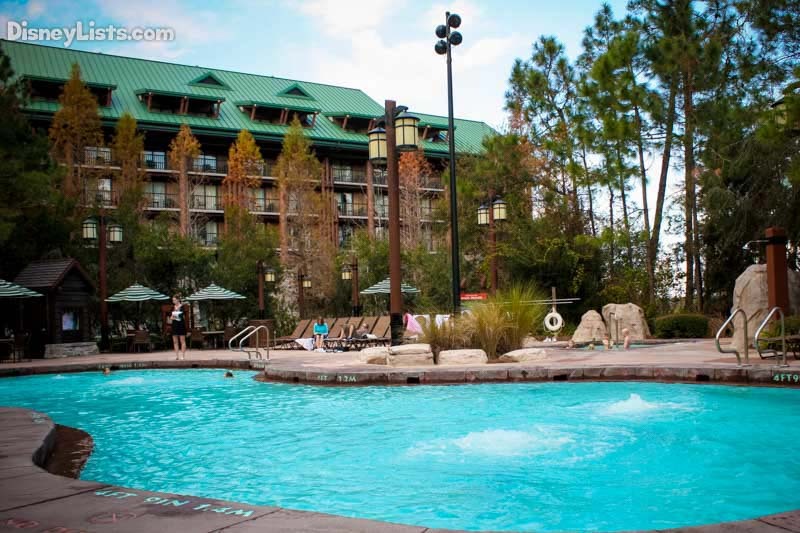 Features: Situated near the Boulder Ridge Villas portion of the Wilderness Lodge is the Hidden Springs Pool. It feels very hidden currently, as it is closed for enhancements through 2017. We are excited to see what updates will be arriving! Kiddie Area: We are uncertain if there will be a kiddie area after the enhancements. Silver Creek Springs is the place to let the kiddos have their own space. Spa: Hidden Springs is well-known for their large whirlpool spa. We hope this baby stays put! Pool Restaurant/Bar: No restaurant/bar at this location before enhancements. Features: Overlooking the Seven Seas Lagoon is the Beach Pool with a natural springs theme, boasting 111,261-gallons, a 181-foot-long waterslide, cascading waterfalls, and zero-depth entry! Take a stroll along the walking bridge for a grand view of the pool. Luxury cabanas are also available to renting. Kiddie Area: Let the kids have a blast in the adjacent water play area! Slides, buckets, leaking towers… they will love every minute of this kiddie area. Spa: Head to the Courtyard Pool to relax in a calming whirlpool. Pool Restaurant/Bar: The white gazebo Beach Pool Bar is calling all those in need of a cooling refreshment. From adult beverages to full entrees, you’ll find your fill at this little spot. Features: A swimmer’s retreat, the Courtyard Pool is a great place to escape away from the crowds. A zero-entry pool (much like the Beach Pool), swimmers can enter the pool gently into a maximum depth of 5 feet. Kiddie Area: All the kids action is located at the Beach Pool (information above). Spa: An adjacent whirlpool spa is available to unwind after a busy day at the park. Pool Restaurant/Bar: The Courtyard Pool Bar has a great dose of heavy entrees, simple snacks, and plenty of alcoholic and non-alcoholic beverages. There you have it! All you need to know about the Deluxe Resort Pools. Now let’s go swimming!